Carl E. Brown. Moulton. Fitchburg. Mass. Cabinet card. Private Collection. No matter, it’s still a great portrait. I found Carl E. Brown on a 1920 census. He was born in Illinois circa 1879 and lived in Lunenburg, MA, a tiny little town right next to tiny little town Fitchburg where this picture was taken. Fitchburg and Lunenburg are about 40 miles west from Boston. He went on to marry a lady named Georgia M. from Vermont. With her he had two children, Thelma born in 1902 and Carl E. born in 1904. 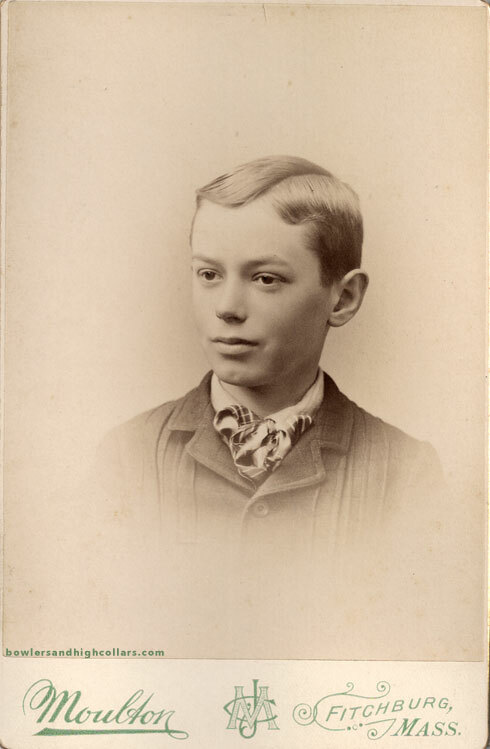 This picture was taken when Carl was around twelve or thirteen in the early 1890s. And finally, I get a cabinet card with an elaborate design on the back with lovely flower patterns and a camera vignette. C.J. Moulton. Artistic Photography. Fitchburg, Mass. This entry was posted on Wednesday, September 16th, 2015 at 7:03 pm	and tagged with 1890s, Carl E. Brown, Fitchburg, Massachusetts, Moulton, portrait, USA and posted in Boys, Cabinet Cards. You can follow any responses to this entry through the RSS 2.0 feed. How did you find out his name? I need better glasses! Nice bit of research by the way. Thanks! Google maps came in handy!